The verdict is in. ABC has renewed its For the People TV show for a second season. Watch the announcement below. The Shondaland TV series comes from creator Paul William Davies — a veteran of the recently ended Scandal. Do not be surprised if there are casting changes and other tweaks made during the hiatus. When a show with ratings this low snags a renewal from the clutches of cancellation, there are almost always changes on the way. An ABC legal drama, For the People stars Britt Robertson, Jasmin Savoy Brown, Ben Rappaport, Susannah Flood, Wesam Keesh, Regé-Jean Page, Ben Shenkman, Hope Davis, Vondie Curtis-Hall, and Anna Deavere Smith. The series is set at “The Mother Court,” i.e. the United States District Court for the Southern District of New York. The story centers on six accomplished attorneys, who work on both sides of the law. Although the network hasn’t yet issues a renewal press release, it announced the renewal on social media. Check it out. 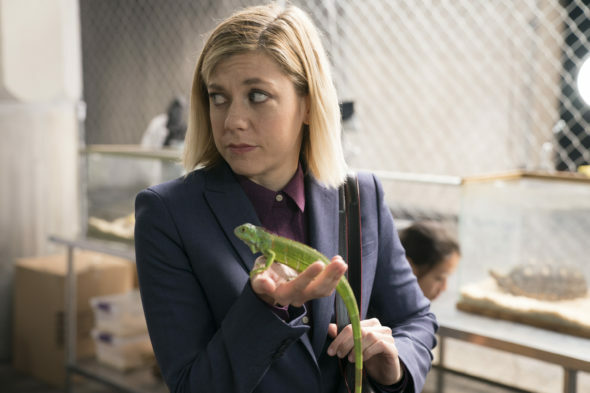 The first season of For the People averaged a 0.66 rating in the 18-49 demographic and 2.64 million viewers. Of the 26 scripted ABC TV shows we’re tracking right now, it ranks 21st when sorted by either measure. All told, today ABC renewed three dramas: For the People (season two); How to Get Away with Murder (season five), and Grey’s spin-off Station 19 (season two). The network also renewed four comedies: American Housewife (season three); Black-ish (season five); Fresh Off the Boat (season five); and Splitting Up Together (season two). What do you think? Did you watch the first season of the For the People TV series? Did you expect ABC to cancel or renew it for season two? Still Star-Crossed: ABC to Re-Title Shondaland Series? That sound you heard was millions clicking off of this show because of it’s NY/CAL liberal slant. Don’t mess with Texas since we’re the only state with more minorities than white people. Also, the recent characterization of ICE was a stupid lie. We will watch no more, forever. I love this show! The cast and story lines are great!! !